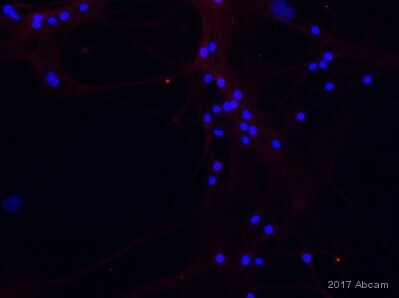 Synthetic peptide within Human SNPH aa 1-100. The exact sequence is proprietary. Our Abpromise guarantee covers the use of ab192605 in the following tested applications. Inhibits SNARE complex formation by absorbing free syntaxin-1. Brain specific. Found in synapses. Immunohistochemical analysis of formalin fixed paraffin embedded human brain labeling SNPH with ab192605 at 1/1000 (1μg/ml) dilution and HRP Polymer to Rabbit/mouse IgG as secondary. Counterstained with Hematoxylin. Immunohistochemical analysis of formalin fixed paraffin embedded mouse brain labeling SNPH with ab192605 at 1/1000 (1μg/ml) dilution and HRP Polymer to Rabbit/mouse IgG as secondary. Counterstained with Hematoxylin. ab192605 has not yet been referenced specifically in any publications. Publishing research using ab192605? Please let us know so that we can cite the reference in this datasheet.